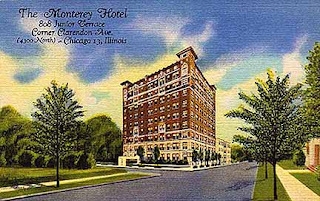 The Monterey Hotel. 808 Junior Terrace, Corner Clarendon Ave. (4300 North) Chicago 13, Illinois. The back of the card reads: The North Shore's finest Residential Hotel. Catering to transient and Residential Guests. Located on the exclusive North Side, Overlooking Lake Michigan, Lincoln Park and the Outer Drive. 15 minutes to Downtown Shopping and Theatre Center. Motor bus at door. 808 Junior Terrace, Chicago 13, IL. Thank you for your site about Uptown. I live in the Hutchinson Historical District and had no idea about the history. BTW, do you happen to know why Uptown was allowed to go down hill for so many years?